Whether you own your own home or you rent an apartment, clutter is most likely something you have to deal with. Even the most organized homeowners end up with clutter at various points. Once you have a little bit of clutter in your home, it is easy for the clutter to grow and multiply with time until you are overwhelmed. It is also easy to underestimate how stubborn clutter can be. In many situations, you set aside time to try and clear out the clutter, only to end up barely making a dent. It is not uncommon to simply move the clutter from one part of your home to another. Fortunately, there are several cleaning tips you can follow if you are having trouble keeping your home organized. When dealing with clutter, do not be afraid to experiment with several different plans. Organization only works if it is a system you are comfortable using and able to understand, otherwise, you ultimately end up creating additional clutter. It may seem like a simple step when you are trying to organize your home but focusing on the clutter is typically the hardest step. Many cleaners end up overwhelmed with clutter. Instead of tackling one area at a time, they try and organize the clutter as they encounter it in the house. In theory, this is an efficient idea, but in practice, it leads to you shuffling different items around and not actually creating an organizational system. For many, one of the reasons clutter forms in the first place is from not knowing what to keep and what to get rid of. If you find yourself constantly dealing with clutter despite using the best storage solutions for your home, then it may be a sign you have too much junk around the house. Sometimes, the only way to effectively get rid of clutter is to throw away items you no longer need. 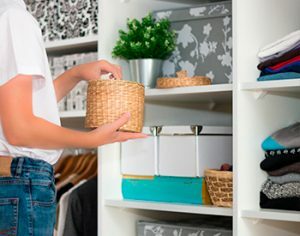 Once you own fewer items, you have a significantly easier time keeping everything organized. When you are organizing your house, consider bringing a trash bag so you are not tempted to hold onto unnecessary items. Depending on where you are cleaning, you may want a separate bag in which to place items you can donate instead of throwing items out. For example, if you have clothing you have not worn in years, then consider taking it to a thrift store instead of throwing it away. One of the most common reasons for clutter is not having a proper place to put items. Where you store things largely depends on the room you are organizing. In the kitchen, dedicating cabinets and drawers to specific items is a great way to stay organized. Keep your plates in one side of the cabinet and your bowls in the other. Place dividers in your drawers to separate forks, spoons and knives. Kitchens are typically the easiest room to organize because it contains so much natural storage space. With other rooms, you may need to get creative. If you have a television stand, then try and prioritize a stand with drawers or cabinets. The space is limited but it is a good place to store movies or video games. A simple organization tip is to install a shelf near your front door. This is a perfect place to place your mail and keys when you come home. One of the reasons a small shelf works for mail is it keeps you from letting your mail pile up since there is only so much space available. You are forced to regularly clean off the shelf before you can place new items on it. If you frequently send mail, then consider adding a small box to store your outgoing items. Another helpful item to install at the front of your door is a coat hanger. Many coat hangers have a shelf built into the top. However, you will want to hang your coat hanger up high so the coats do not touch the ground, which may limit whether you can reasonably use the shelf. Some homeowners use this space for important items they only use in specific situations. For example, you can keep your backup car key or a spare phone charger on the shelf. If you do not have natural storage space in your living room, then consider installing hooks on the wall to hang canvas bags from. These bags are particularly effective to store toys in if you have young children. If there are specific items you do not want your child accessing without your permission, then you can install the bags higher on the wall. Not only is this a cheap method to create additional storage space, but you can use colorful or patterned bags to add some flair to your walls as an easy way to redecorate. If you find yourself constantly dealing with garbage in your house, then an easy solution is to install wastebaskets in every room so you always have a place to deposit trash. Similarly, consider keeping a dustpan in every room to deal with dust buildups. If you want to stay on top of cleaning, then keep all your cleaning supplies in a single plastic container. If you have small children, then keep it out of reach in a secure closet. Finally, storage boxes are an effective way to organize your items, but the containers are only effective when you remember what is inside of them. Otherwise, you end up pulling out boxes and shuffling all the items around when you are looking for something specific. To avoid this problem, always label your containers. The bigger the label, the easier it is to correctly select the right box from the start.